Would you like to contact us? Fill out the form below. Hotel Desirèe is located in the heart of the old town, at Fiume n.20, not far from the major museums and monuments of the city. Staying here you will have the opportunity to visit Florence’s historic center on foot. Coming from Milan- Bologna (A1 motorway) take the Firenze Nord exit and follow the signs for Centro/Stazione S. M. Novella. Coming from Rome (A1 motorway) take the Firenze Sud exit and follow the signs for Centro/Stazione S. M. Novella. Coming from Pisa (A11 motorway) follow the motorway right to the end, then follow the signs for Centro/Stazione S. M. Novella. Via Fiume is just 50 metres from the SMN railway station..
Firenze Rifredi and Firenze Campo Di Marte railway station are 10 minutes far by Taxi or by Local Bus. The international airport “Amerigo Vespucci” is located in the north-west suburban area of Florence. There are many airlines arriving there and connecting the city to some of the most important European airports. 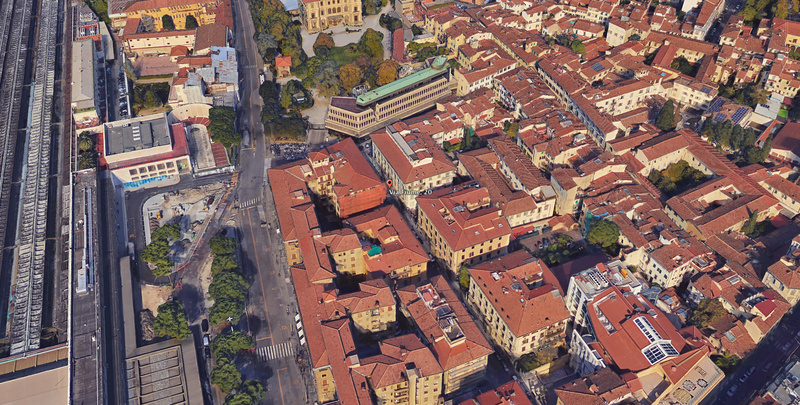 The airport is only 4 km from the city centre, which can be easily reached by Taxi or with the Sita “Vola in Bus” shuttle service (around 15/20 minutes), connecting the airport to the main central railway station of Santa Maria Novella. The international airport of Pisa is located 80 km from the city centre of Florence and is connected to the Tuscan capital by train (Every hour) and Terravision bus shuttle service.